This is the second coconut cake recipe on SouthernPlate.com. To see my recipe for Daddy’s Coconut Cake, please click here. Today I had planned on impressing you with my detailed listing of the name of every teacher who has ever taught me. I even had the entire post written up in a rough draft, weaving a storyline in betwixt of the impact all of my teachers have had on who I am today. But sometimes, just because you are ready to tell a story, doesn’t mean it is time for that particular story to be told. You see I just returned home, and now I have another story. This morning Brady had to go take a placement test at his school so I took my computer up there with me, thinking I’d sit and work on my blog post while I waited – but apparently that wasn’t what I was meant to do today. I just love it when our own plans are pushed aside for something better, don’t you? I learned back on my book tour how important it is to pay attention to people who are placed right in front of you, or in many cases beside you. Up until last October, I was not well acquainted with traveling by myself and had never thought I would be. But I found myself on countless flights that month, each time traveling alone, and just about every time sitting right next to the exact person I needed to be sitting next to. At the start of my tour I would carry a book as a backup plan but by the time the end of my tour rolled around I would just get on the plane, situate my stuff, and sit and wait to see what was in store for me. I’d watch the door as other passengers boarded and got so in tune with the ebb and flow of fate that oftentimes I instantly recognized who my seatmate was the moment they came on the plane. “Well, lets see what I’m gonna learn on this leg of my trip” I’d think to myself. Sometimes it would be a person I would have an opportunity to help in some way, sometimes it would be a person who was there to help me in some way, but each time I sat beside someone with an open and receptive heart, I was able to glean the wisdom they were there to give and as a result, each time I got off an airplane, I was a better person than when I had boarded. It’s amazing how many people like this are put into our lives every single day. It’s like a fishing pole with bait is placed right before us all throughout the day and whenever we bite, whenever we pay attention to it, we get the benefit of the worm. I shudder to think of how many times I’ve waded right through water infested with worm filled hooks just waiting on me and I never noticed a single one because my mind is too busy with tasks at hand or worries of the day. Like most other fish in this big ocean of ours, I’ve suffered some severe malnutrition in my time simply by not taking notice of the worms around me. And so, as I’ve grown in years and lessened slightly in my own foolishness, I’ve learned to be more receptive. Her smile had come just as easily as my own and over the next few minutes we struck up a conversation that had me closing my computer and leaning in on it as she spoke. It was one of those conversations where a stranger begins suddenly sharing their heart with you and every word seems to echo one that was already in your head. Definitely not a coincidence, but a meant-to-be. Teresa and I were both still talking when her son got finished with the test and came in to patiently wait on us. We were still talking several minutes later when Brady came in and sat down to patiently wait on us. When we finally rose to exit, we continued talking down the hallway, down the stairs, into the lobby, and down the front walkway of the school. She encouraged me, she enlightened me, she shared with me words of wisdom that echoed thoughts already in my head and words of wisdom that turned on light bulbs. I had expected to get some work done but I didn’t realize when I woke up this morning and someone else was planning on orchestrating an encouragement session for me through the guise of a stranger waiting in an empty classroom. I don’t believe in coincidences. I believe in meant-to-be. It’s not only early birds who get the worm. It’s the person who has the sense to see it when it looks them in the eye and smiles. I think we’re all offered worms each day. It is our own fault if we go away hungry. This cake is from another gem of a person who was placed into my life, Miss Patsy McGough. We had a ladies meeting at church this past Sunday and everyone was asked to bring a dish. Lo and behold, I ended up with a piece of one of the best coconut cakes I’ve ever had on my plate and guess who should make it but Miss Patsy herself! I chatted with her a few precious minutes and it turns out she follows Southern Plate. I said, “This cake is wonderful” and she replied “Aw honey, I hate to tell anyone the recipe because it’s just too easy!”. 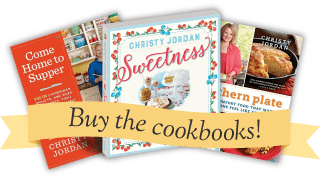 I assured her that the recipes I always thought of as “too easy” were the ones that were the biggest hits on Southern Plate and when she shared it with me I remarked about how it was very much like my Butterfinger cake, which is one of the most popular recipes on the website. She was kind enough to give me permission to share her recipe with you and I know you’re going to enjoy the ease and amazing coconut infused taste of this light tasting cake. Miss Patsy, just getting to talk to you those few minutes made my step a little lighter and my heart a little happier. I hope you read this post and understand that when I say you were definitely a worm for me that day, I mean that in the best kind of way! You’ll need: Yellow Cake Mix (which you will prepare according to package directions), Cream of Coconut, sweetened flaked coconut, sweetened condensed milk, and some whipped topping*. Prepare your cake according to package directions. 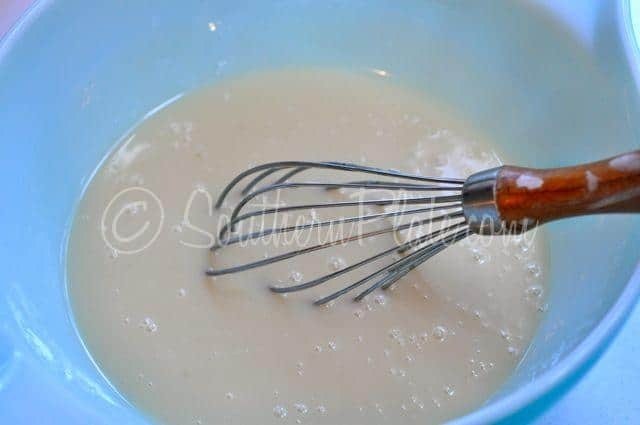 You know, any time a recipe calls for a whole can of sweetened condensed milk, I always add almost a whole can…because I have to have a little bit for myself! I love this stuff. A few folks have posted on Facebook and in comments that they use it in my iced coffee concentrate to make the perfect cup of coffee and that is at the top of my to do list to try one of these days. Add your cream of coconut. 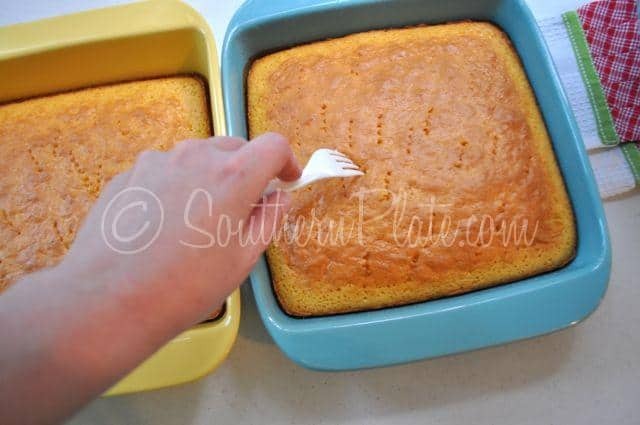 As soon as your cakes are done, poke holes all in the top of them with a fork. I am using a plastic fork because I was photographing this and sent Brady into the kitchen to get me one and this is what he brought back. For a moment I paused and thought about “Now it won’t look very nice if I’m using a plastic fork in the photos on Southern Plate”. Then I immediately got over myself and just used it. We’re all family here, anytime we feel the need to put on airs we’re just wasting energy that can best be spent cleaning our kitchens anyway. Pour the mixture over your hot cake. It’ll all soak in there real good over time. Now cover your cake and let it cool, then put it in the refrigerator until it is completely cold. 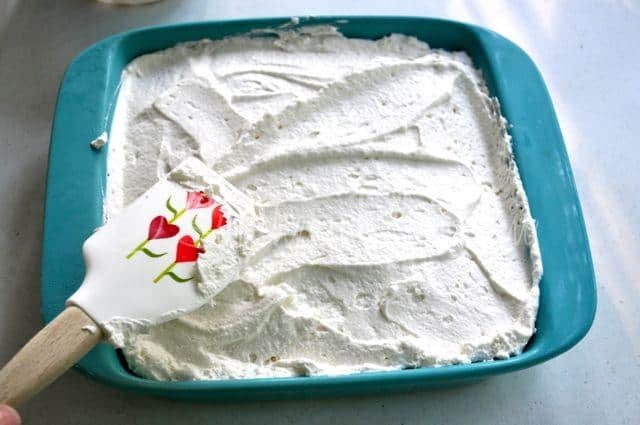 Once your cake is good and cold, ice with whipped topping. 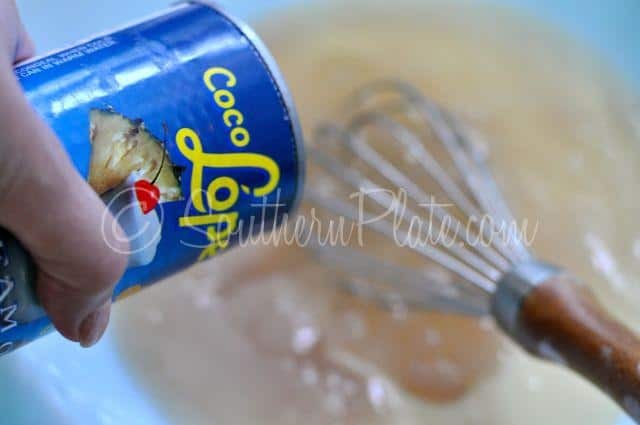 If you want, you can make this from scratch but I usually opt for doing it the easy way because it saves a lot of money and is one less dish to wash.
My recipe for homemade whipped cream is on this post (click here). Now we need to toast our coconut. You can add it on there as it is but toasting it gives it a neat, nutty texture and a beautiful color. Either way, just go with what you’re in the mood for but I’m gonna show ya how to toast it just in case. Place coconut on a baking sheet and put it in a 350 degree oven. 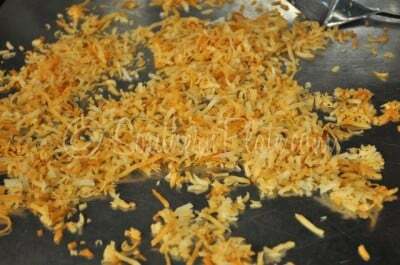 Watch this carefully and stir it often until it is nice and uniformly brown, anywhere from 10-15 minutes. Here it is, all done! You can toast it more or less, depending on the level of patience you have at the time you are fooling with it. Let it cool for a few minutes when you’re done before moving on to the next step. Sprinkle that on top of your cake and you’re ready to go! 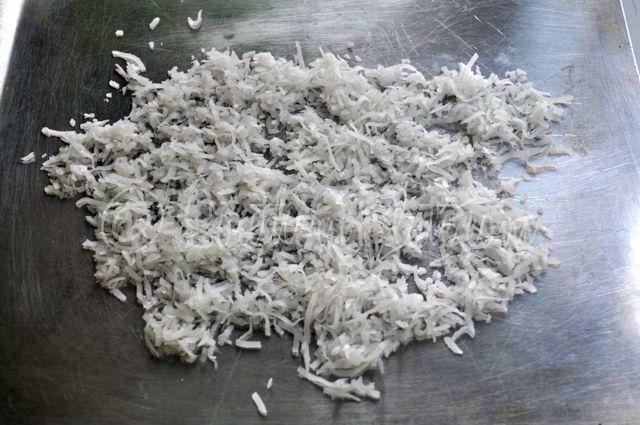 1 cup sweetened flaked coconut. Remove fully baked cakes from oven and immediately poke holes all in the top of them with a fork. 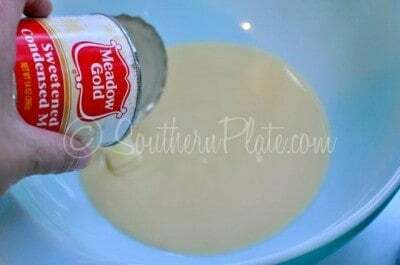 In medium bowl, whisk together cream of coconut and sweetened condensed milk until well combined. Pour over hot cake. Allow cake to cool and then cover and refrigerate until fully cold. Top with whipped topping and toasted coconut. Refrigerate until ready to serve. To toast coconut: Spread coconut out on a baking sheet and place in 350 degree oven, watching carefully and stirring often, until lightly browned, about ten to fifteen minuts. * Cream of Coconut is usually found near the alcohol section in stores because. It has no alcohol in it but is often used in mixing alcoholic drinks, thus the placement. This recipe format and the “save recipe” feature (see top of recipe above) is brand new to Southern Plate! You can now save Southern Plate recipes to a recipe box and use that box to add ingredients to a grocery list as well. There is even a free corresponding iPhone app that allows you to access your recipe box on your telephone (Just search for ZipList in the app store). I am in the process of coding every single recipe on SouthernPlate.com to work with this great new feature so in the meantime you may notice that some recipes do and some don’t as of yet. I hope to have them all converted in the next few weeks so stay tuned! Would love a bite now. Fortunately, unlike myself, Mama has made a pina colada before! 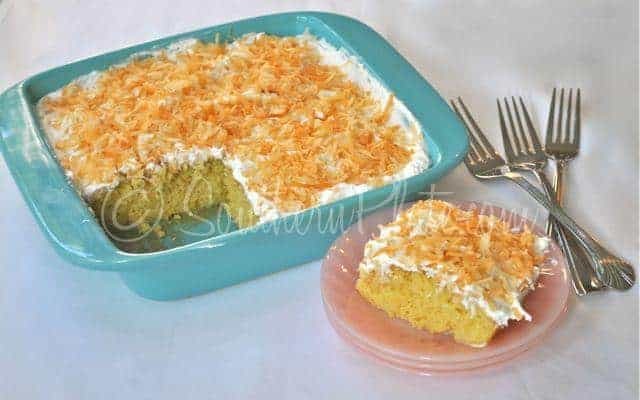 After looking at your recipe, it is identical to the one my mother has made for years, but it is called “Pina Colada Cake”. Oh, my! This is very similar to a cake my mama makes! 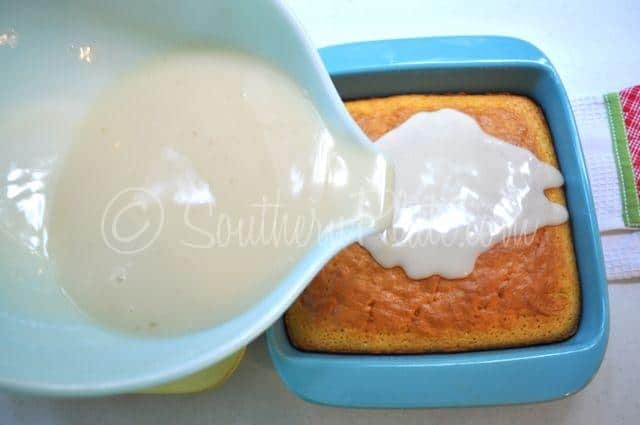 We leave out the sweetened condensed milk, and we freeze it. She also puts a cup of coconut in the cake batter. Let is sit about 10-20 minutes when it comes out of the freezer before you cut it. This is so yummy for summer, because it’s nice and cold. you are really a wonderful person. This looks positively sinful. Is it rich? Um, yes .. very rich. But very tasty, and a fabulous dessert for a Sunday, when you cook lunch and then have the afternoon to sit around and enjoy the time visiting, until it’s time for dessert. Oh yes! This is exactly my Pina Colada Cake recipe minus the pineapple. Everyone wants the recipe when I take this somewhere. You are right about it being the moistest cake ever and to me it gets better the longer it sits. Oh, YESSSS! this is definitely the same pina colada cake, too, and I used to make it frequently … it’s a huge hit at a dinner party, Sunday lunch, or a dessert party, or .. hey, any occasion you make it! Sometimes, I put the coconut (I use canned, because that’s what the original recipe that I had, calls for) into the Cool Whip (and I’m gonna try your homemade whipped cream recipe, Christy) and fold it in, gently. I have also put canned crushed pineapple into this cake – drained and folded into the Cool Whip, I think? Instead of or maybe along with the coconut. Thanks for the good recipe AND the good memories, Christy and Miss Patsy. 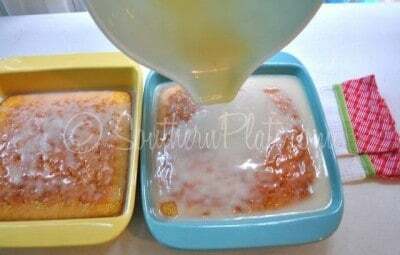 My recipe says to add the pineapple to the cake batter (drain it first, and use the liquid in making the cake). It also adds a teaspoon of rum flavoring to the batter as well. YUM!! I make this cake too. I got the recipe from my mother in-law and everyone loves it!. It is so easy and do good! I just adore you lol..reading your posts make me smile SO much! :) thank you for that!! don’t you just love those divine appointments that God makes for us? He knew just what you needed, didn’t He. I make this cake too, it was my late boss’ favorite. we lost him 4 years ago at the age of 89. He was a WWII glider pilot, cussed like a sailor’s parrot, smoked like a bad chimney, loved good scotch- and I miss him every day. Thank you so much for the wonderful post today, I really needed it! I love this cake. 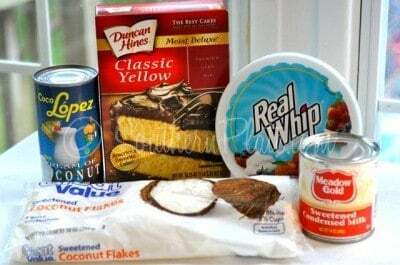 I thow in a can of crushed pineapple under the coolwhip and call it Pina Colada Cake! Looks decadent! Can’t wait to try it. Christy I just love reading your posts. You are such a gem yourself! This cake looks so good, I am going to have to put this on my list to try. Thanks for another easy recipe, Thanks Ms. Patsy for sharing! I just made this cake recently. I have my mother-in-law’s recipe. She didn’t toast the coconut and neither do I, but maybe I will next time. It is a wonderful cake and she was a wonderful lady. She passed away a few years ago and I always think of her when I make this cake. I make this cake, but haven’t tried it with toasted coconut. You need to try it with a chocolate cake mix. Love this recipe, been making it for years. My aunt would always have one or two frozen to give to someone in need. It’s much better if you can leave it alone (which is hard cause it’s so yummy) and let it sit and soak up the flavor for a couple days! I love this cake. I used to make it years ago then lost the recipe.I’m soooo glad to find it today!!! Thank you so much for sharing your life with us….I receive many blessing from your post…. I have made this recipe for many years! It is absolutely the most moist cake ever! 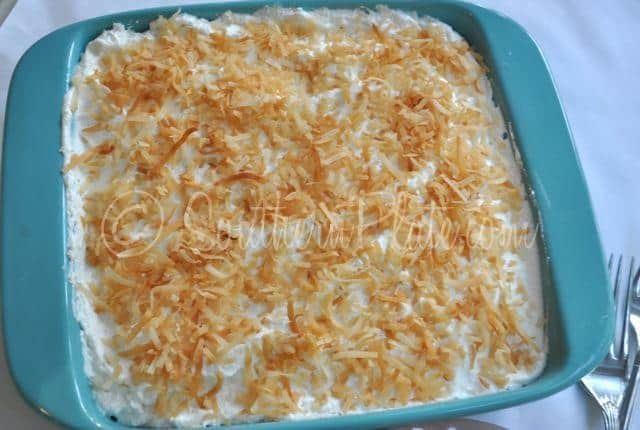 Everyone is so surprised when I share the recipe and they see how easy it is — the hardest part is finding the creme of coconut! I have found it in the drink mixes. I don’t drink, but was told it might be there–Lo and behold, there it was. Christy, I just love how you keep it real and you don’t put on airs. That just makes you precious to me. I hope I get to sit beside you on a plane ride one day. What a blessing that would be!! I’m baking this cake real soon. It looks yummy! Wonderful post…isn’t it fun to see how God works in our lives using the people He puts in our paths?! Sure looking forward to making this cake. Fred loves coconut and I can easily make this gluten free!! Anyway to make this for okay for diabetics? It seems like a lot of sugar. But oh so good. This one would take a lot of tweaking I’m afraid. Each ingredient has sugar (most lots). I just have a bite or two when I make it and instead make myself a splenda coconut meringue pie! Yum! 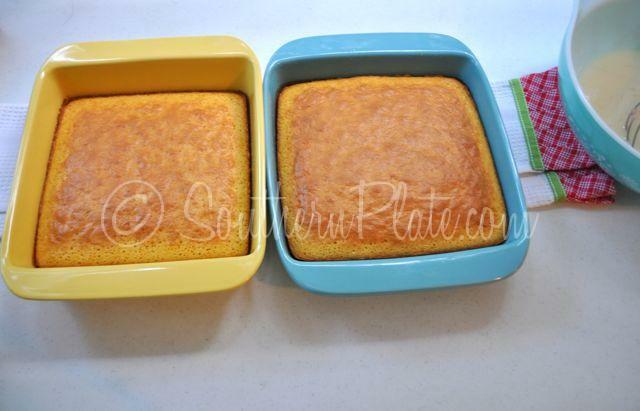 Have you checked out the better for your diet recipe post on SouthernPlate and the splenda recipe list in my book? Christy, this is almost exactly like a Tres Leches (3 milk) cake a friend taught me how to make. It is so moist and good that you’ll get addicted!!!! Believe me, beause for about a month I dreamt of and craved this cake!!!! The cake freezes wonderfully! Mama always makes it at Easter time and bakes two small cakes. Around the fourth of July she pops the other out of the freezer and let’s it thaw. That one always seems better because it’s been letting all those flavors infuse together…yum!! Hey, Patsy here from south Mississipppi. Not the same Patsy, but I make this cake also. It is sooo good. Everyone at church loves it.